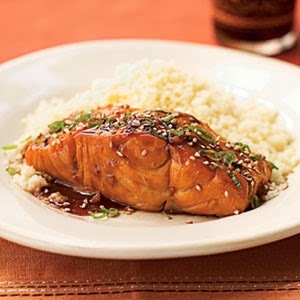 THE MARTINI CHRONICLES: Quick Meals For A Busy Diva...Bourbon Glazed Salmon! Quick Meals For A Busy Diva...Bourbon Glazed Salmon! Greetings Divas! Quick question: how many of you are really in the mood to cook a meal after a long day at work? Well, let me be honest and let you all know that when I get home from work, cooking can sometimes feel like torture. Yes, I said torture! I do realize, however, that making your own meals at home is a great way to save money and is oftentimes healthier. So I press on, and I try to cook dinner at least 3 times per week. Because I am usually short on time, I tend to search the Internet to find meals that can be prepared in under an hour. A few nights ago, I found a really interesting-looking recipe for Bourbon Glazed Salmon...they had me at Bourbon! I checked out the ingredients, and I had everything in my kitchen. Everything except the Bourbon...what! Refusing to be defeated, I searched my bar for a substitute, and I found one! I made this recipe with Grand Marnier instead. Now, I will provide the recipe with the Bourbon ingredient, but the Grand Marnier was really tasty. Why not try both! Full disclosure: there is a 1.5 hour sitting period for the marinade. But this is just enough time to cook a vegetable, take a shower, bathe the baby, clean the bathroom, talk to your girlfriend on the phone...any one of your chores that you had scheduled for yourself. When you are done choring (I made that up! ), grab the marinated salmon from the refrigerator and make it happen! 1. Combine first 7 ingredients in a large zip-top plastic bag. Add fish to bag; seal. Marinate in refrigerator 1 1/2 hours, turning occasionally. 2. Heat a large nonstick skillet over medium-high heat. Coat pan with cooking spray. Add fish and marinade to pan; cook fish 4 minutes on each side or until fish flakes easily when tested with a fork or until desired degree of doneness. Place 1 fillet on each of 4 plates; drizzle each serving with about 2 teaspoons sauce. Sprinkle each serving with 1 tablespoon green onions and 3/4 teaspoon sesame seeds. Just in case you were curious, this recipe is only 353 calories per serving....just throwing that in there for you Divas who made that oh so infamous resolution for the new year! Enjoy!